The Megalith Delta is part of the high gain MI Audio voyage that all began with the MI Amplification Megalith Beta 180W monster. It took some time for me to really understand the variables behind great high gain tones, but by designing the Megalith Beta from the ground up, I was able to really grasp how to make a complex, sophisticated high gain sound that kept all the nuances, huge bottom end and the clarity and character of the top end. 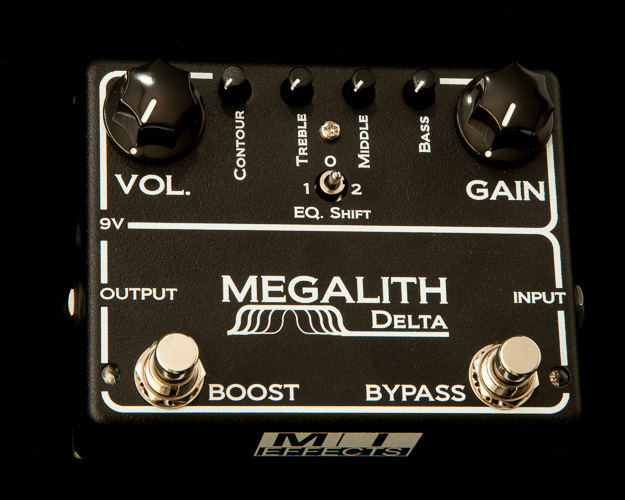 All of these tricks and secrets have now passed onto pedal form, the Megalith Delta. MI AUDIO MEGALITH DELTA HIGH GAIN DISTORTIONThe Megalith Delta is part of the high gain MI Audio voyage that all began with the MI Amplification Megalith Beta 180W monster. It took some time for me to really understand the variables behind great high gain tones, but by designing the Megalith Beta from the ground up, I was able to really grasp how to make a complex, sophisticated high gain sound that kept all the nuances, huge bottom end and the clarity and character of the top end. All of these tricks and secrets have now passed onto pedal form, the Megalith Delta.The Megalith Delta pedal is a solid state ‘model’ of the Beta preamp, using JFETs to simulate the gain stages of the preamp valves. The transfer characteristics of FETs are very tube-like, so it seemed that this was a great place to start. However, making a FET stage behave like a particular tube stage is a very complex affair. Often, it’s just the exact same circuit as the ‘simulated’ amp, but with FETs instead of tubes, adjusted source or drain resistances, and 9V operation. Little or no thought is often given to the operating points, dynamic range, scaling of clipping thresholds, output impedances, and intrinsic capacitances due to things like the miller effect etc. In a nutshell, I was able to feed all these parameters into the Megalith Delta design, and come up with something which is as close as humanly possible to the original. Because of this attention to detail, I really feel the Delta will deliver all of the brutal, articulate and sophisticated tones the Megalith name has become synonymous with. The Megalith Delta starts in mid-gain territory. THIS IS A HIGH GAIN PEDAL! BACK AWAY NOW IF YOU ARE SEARCHING FOR THE VINTAGE BLUES TONES! The GAIN control offers a wide sweep in gain, from solid rock tones, to serious crunch, to every dark shade of brutal imaginable. The stock, un-boosted tone is very fat in the low mids and is the Megalith’s thickest tone. This is a great mode for getting the punchiest rhythm sounds. The GAIN control has a responsive interaction with each of the three EQ options (EQ SWITCH, CONTOUR, and THREE BAND EQ), allowing you to dial in, for example a slightly woolly tone at minimum gain, and with flat-out brutality at maximum. The second footswitch of the pedal, BOOST, takes the pedal from a mid-gain base to its highest gain. 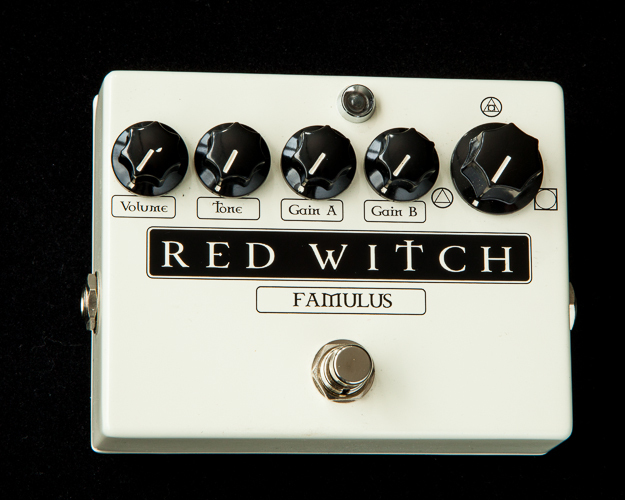 This footswitch is equivalent to flicking over to the HIGH GAIN setting on the Megalith Beta amplifier. This BOOST mode not only adds more gain, but also tightens the response up considerably, with more of an upper mid emphasis. I thought by adding this gain boost as a foot switch, it gives you the option to really step up the crazy. I also figured that mid to high switching was a lot more useful than low to high, as there are already plenty of great options out there for the lower gain sounds. Let’s face it, someone interested in the Megalith Delta isn’t going to be too stressed about missing the low gain mode! The contour control is another unique feature of the Megalith design .In the Megalith Beta amplifier; it affects the frequency response of the phase inverter in the power amp. I went to a lot of effort to recreate the CONTOUR control in the Megalith Delta pedal to mimic this response by designing a phase-inverter like stage, and integrating the CONTOUR control into it. Fully clock-wise, it’s fat and midrangy, with a slightly rolled off top end. As the CONTOUR control is turned down, the mids start to scoop out, and the sub-bass frequencies tighten up. 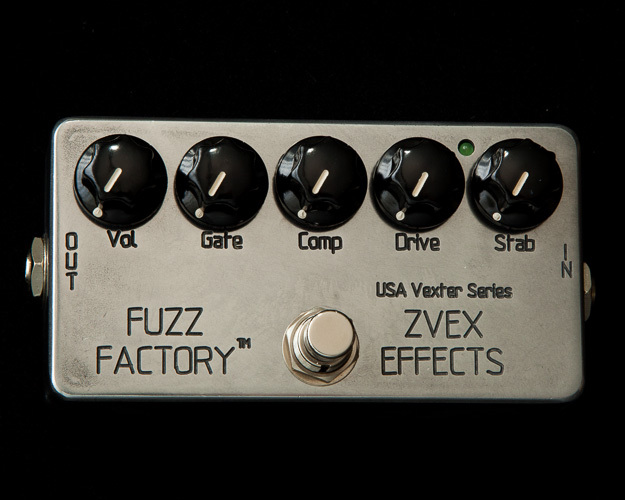 This is a great control for further refinement of the overall high gain tone. You can also think of this as an alternate midrange control. Try running the MID EQ control high and the CONTOUR low (also adjusting the EQ shift), and visa versa for a huge range of tones. The combinations of the EQ section will give an impressive number of high gain sounds, just like the Megalith Beta amplifier. The first thing to note about the three-band EQ on the Megalith Delta is that each control has a wider sweep than your typical tone stack. Small changes to these controls can have a large impact on the tone. They are also highly interactive. That is why I recommend using this feature to fine-tune your overall sound. The three position EQ SHIFT SWITCH is a unique feature of the Megalith’s tone controls. This switch shifts the EQ’s bands, allowing you to control different frequencies. Each position has a particular signature tone, and is useful for different things. The middle position “0” shifts the midrange up, and adds quite a bit of low-mids to the sound. 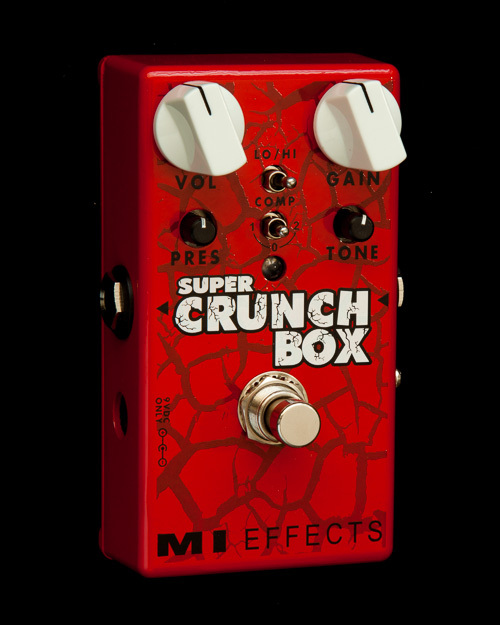 This is great for really fattening up the tone, and works particularly well with boost pedals. Position “1” voices the tone stack closer to a traditional British voicing. There’s still a good amount of midrange in the tone, but the tone is more balanced. Position “2” is more of a traditional American voicing, with a more scooped and shifted midrange. A big part of the Megalith Beta amplifier’s huge gain sound is the 160 Watts of headroom! Of course, this would always be the limitation in trying to emulate a high gain amplifier to stomp box form. But by adding voltage doubling circuitry in the Megalith Delta pedal, it allows the 9V supplied by battery, or DC adaptor, to be increased to 18V within the pedal’s circuitry. This has the advantage of producing the crushing low end without mush, much like the 160W output of the Megalith Beta does at the amp level. Finally, I designed an output section which is designed to ‘compensate’ for the standard guitar amp’s clean channel response, so that when you plug the Megalith pedal into a ‘reference’ clean amp, you get something close to the feel of the Megalith Beta. Having said that, one of the main aspects of the Megalith Beta’s ‘presence’ is the sheer headroom and output power it has. So no, you probably won’t unleash carnage and devastation plugging a Megalith Delta into a 5W lunch-box amp. That’s just the physics of it,… a reality more inviolable than the existence of fragile harmonics in a crystal lattice.